Undeniably one of the greatest women ropers of all time, Jackie Crawford has 14 World Titles to her name as well as numerous other accolades. Her passion for teaching led to recognition as a renowned clinician, and she is acknowledged as one of the greatest horsemen in the business. In this DVD you will find the most unique angles and views of breakaway calf roping technology provides! 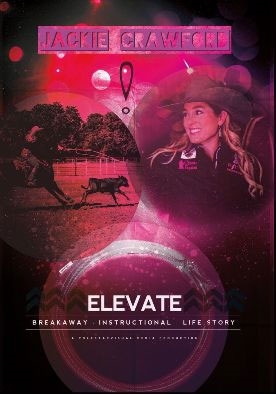 Elevate covers basics for beginners, Horsemanship, common mistakes, and is packed with visual footage of breakaway runs. Don’t miss the special guests invited to share their roping techniques and opinions on Elevate. Guests include Joe Beaver, JJ Hampton, Lari Dee Guy, and Cody Ohl. No Matter your level of Roping, this DVD will help “Elevate” you to the next level!